The folding step stool is very simple to use, but if your children are small and use it at first time, You can teach them to put their fingers in a good location to open it. To avoid they wrong operate and pinch their fingers. You can use the Acko folding step stool to reach things on the top shelves of your cupboards, instead of to drag around your heavy wooden chair every time. You can also use it for the kids to step up to wash their hands or brush teeth. It opens and closes very easily and feels very sturdy, and it's very lightweight so he can easily move it. LIGHT WEIGHT: You will find this stool super sturdy while at the same time very lightweight. It is very easy for a toddler to carry it. SPACE SAVING: Folds up flat when you pick it up by the handle in the middle of the seat area and can be stored in any corner or closet wherever you might have a space. STURDY: Made of special lightweight and strong new PP material. 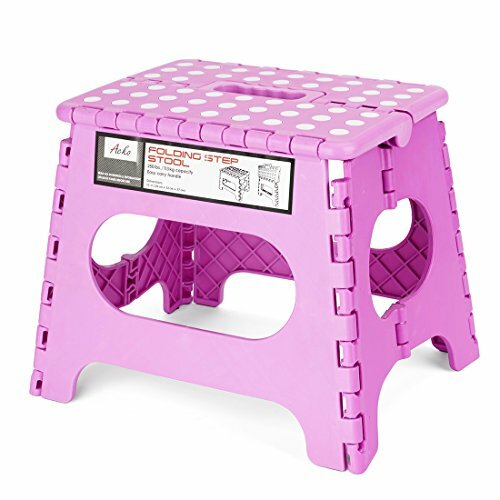 The ACKO Folding Step Stool effortlessly holds up to 250 pounds. NON-SLIP: With non-slip rubber dots on platform and with grip rubber feet. You will feel comfortably secure standing on it. ROUND CORNERS: Round corner design at the edge to protect you and your family from scratching.